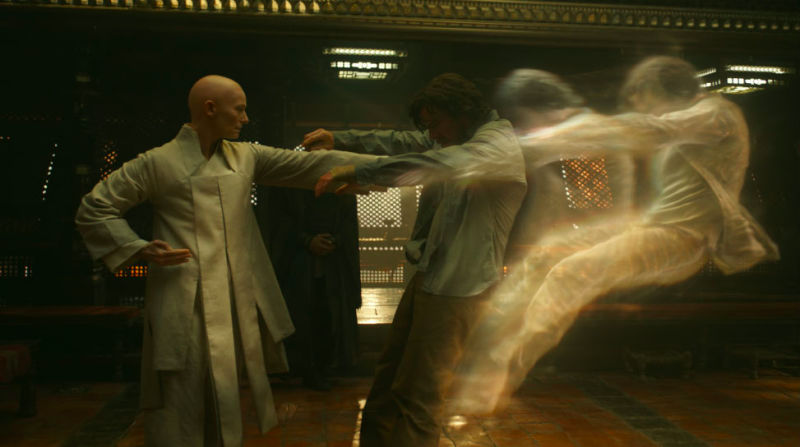 In the continuing saga of Doctor Strange: Accidental Racist, Scott Derrickson’s latest defense of casting Tilda Swinton in the role of the Ancient One is that, hey, they cast Benedict Wong as Wong, who is Strange’s sidekick and servant in the comics but is a powerful master in the movie. After removing him initially. Diversity in movies is absolutely the responsibility of producers and directors. In this movie, we have about as diverse a cast as I think you can get, and that was a very conscious decision. Tilda was a way of adding diversity in terms of not just an ethereal, enigmatic, otherworldly actress playing an ethereal, enigmatic, otherworldly character, but we’re bringing a middle-aged woman who’s not 28 years old in leather pants into the Marvel Universe in a major role. It is great that Doctor Strange has a major female role not played by a young model. But when the only example of diversity you can offer is one of the white lady you cast, that’s not a good look. He could have brought up Chiwetel Ejiofor as Karl Mordo, who is a Black actor playing the role of Karl Mordo, a white role in the comics. But he’s got to bring up Swinton because he’s going to defend that casting choice one more time. I was very happy with that, but I was also very conscious that in doing that I was erasing a significant potential Asian role. I was going to leave Wong out of the movie at first; he was an Asian sidekick manservant, what was I supposed to do with that? But once the decision was made to cast Tilda, we brought Wong back because, unlike the Ancient One, he could be completely subverted as a character and reworked into something that didn’t fall into any of the stereotypes of the comics. So, the original version of this movie erased another Asian character because it was an offensive stereotype. And then, when they cast a white woman in the only remaining major Asian role, realized that was a problem, and put Wong back in. Because, at that point, Derrickson had suddenly come to a realization there was a way to do the “Asian sidekick manservant” part in a subversive way. But, apparently, there wasn’t a way to do a non-offensive version of the Ancient One, which he hadn’t left out of the story for being a stereotype. Derrickson’s logic appears to be that the only way to fix that role was to not have it be Asian at all. I don’t even know where to start. I could begin with the fact that Derrickson’s first impulse was to not even try to tackle the character of Wong, and delete the character from the movie altogether. Or with the part where he recognized the racist stereotypes inherent in the Doctor Strange story, but couldn’t come up with anything better than “erase the character or turn it into a white person.” Or with the part where Derrickson admits that he knew casting Swinton was erasure and did it anyway, rather than trying to find a “middle-aged woman who’s not 28 years old in leather pants” who was Asian. How about the idea that he thought he could “fix” the problem by adding an Asian character that should have been there in the first place? Which is the definition of tokenism. It was only then that he bothered to find a way to include Wong in a “subversive” way. Which leaves me wondering if his protestations that there was no way to subvert the Ancient One’s role are BS and that, really, what he should have done was work harder, like he eventually did for Wong. Once Marvel picked Doctor Strange as a movie, it had a problem. Stephen Strange’s origin story is racist. The whole thing is based on a white person traveling to a land of Asian stereotypes. Making a non-offensive version of that story required a lot of work that no one on this movie seemed willing to do. It’s telling that, in both cases, the first impulse was to erase the Asian character from the narrative. There are better solutions.